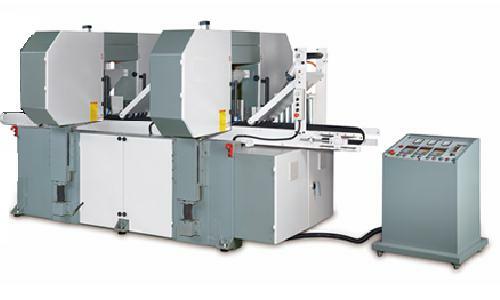 Machine was built with rugged construction throughout for maximum stability, high precision cutting and minimum trouble. It is equipped with a digital controller for convenient and accurate thickness setting. The feed conveyor has a tilting design allowing for maximum 30-degree bevel cuts. When the feed conveyor is tilted for bevel cutting, a side support is applied for safe and stable cutting operations. Variable feed speed is controlled by a frequency inverter for best cutting requested. The infeed and outfeed pressure rollers are easily raised or lowered by a gear rack. The infeed and outfeed pressure rollers are spring loaded and easily adjusted for the horizontal or vertical direction to suit various workpiece thicknesses. Blade tension is adjusted by means of a hand wheel. A tension scale allows the operator to correctly adjust the tension for different blade thicknesses. The cast iron saw blade wheel are dynamically balanced for smooth running. Blade guard is easily lifted up, supported by two nitrogen gas cylinders for convenient blade change. The roller type return conveyor equipped at left side of the machine provides easy repetitive cutting.